CSS Light Ox Hair Varnishing Brush: The CSS Light Ox Hair Varnishing Brush is made in Ireland by the finest craftsman to our specification. CSS Medium Ox Hair Varnishing Brush: Our CSS Dark Ox Hair Varnishing Brush is made right here in the United States. CSS Small Light Ox Hair Var Brush: The CSS Series 1135 varnish brush is made of fine light Ox hair. This is a good all purpose brush that can be used for varnishing, cleaning, applying gilders clay and much more. 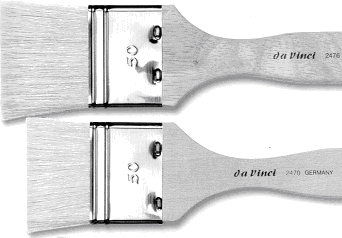 Da Vinci Ox Hair Varnishing Brush: The Da Vinci 560 varnish brush is made of fine light Ox hair. Omega 1030 Bristle Varnishing Brush: The Omega series 1030 is technically a "Spalter". Omega 40 Bristle Varnishing Brush: The Omega Series 40 brush is by far one of the finest varnishing brushes made. Omega brushes are made with the finest white, pure Setola bristles that are noted for their resilience and durability. Omega Filbert Bristle Varnishing Brush: The Omega filbert style varnishing brush is rounded on the sides of the tip and is well chiseled to give a soft effect to this brush. The brush is made with white Setola bristles. Omega Oval Varnishing Brush: Full ovals are preferred by many for varnishing work. These brushes are hand-cut for exceptional control. Polyfoam Brush: Our polyfoam brush can be used to apply varnish, water and oil based paints and other coatings.